manufactures and markets quality branded nutritional supplements and premium bulk formulations for sale to health food stores and other manufacturers and marketers in the nutritional supplement industry. (nasdaq: nutr). Domestic grower and processor of air-dried culinary herbs. US. suppliers of medicinal herbs, plants and herbal products. haldawani. Producer and distributor of a variety of fresh culinary herbs. Includes availability and wholesale pricing. Grower and processor of culinary and medicinal herbs and spices. Company profile and product details. a family owned and operated business that provides 200+ bulk herbs and herbal products to herbalists, health food stores, and individuals. a family owned and operated business that provides bulk herbs and herbal products to herbalists, health food stores, and individuals. south african producer, distiller, market of essential oils and hydrosols packaged in retail sizes, also offers herbs, herbal products, and consulting. exporter of medicinal herbal products, medical herbs, and medicinal herb plants from india. Growers of organic hydroponically grown greenhouse culinary herbs and winter berries. provide herbal medicine, phytotherapy, herbal remedies, alternative medicine, herbs for humans, pets and animals. manufacturer of ginseng extract, patent medicines and medical material, china ginseng-herbs, herbs, pan ginseng, pharmaceuticals, chinese herbal medicals. Trading place for organic herbs and spices from all origins. Retail line of herbs and herbal formulas. wholesale herbs, tinctures, teas, and blended capsules. exporter of senna products and other medicinal herbs. Italian grower of organic aromatic herbs. malaysian research driven herbal company. View images of culinary herbs and medicinal plants, available on CD. Close-ups of fruit, vegetables, mushrooms, and herbs for commercial use. Provider of organic herbs, spices, botanical and nutraceutical ingredients. Singapore dealer in spices and herbs. Offers nutrition, herbs, womens, health, and beauty products. outsourcing of herbal extracts, nutraceuticals, raw and whole herbs, and other biopharmacological products. Offering herbs, aromatherapy, coffee, organic and natural products. Offers vegetable, flower, herbs, seeds, and gardening accessories. Exporters of spices, seeds, medicinal and aromatic herbs. Turkey. Offers nutrition, herbs, womens, health concern, and beauty products. Export and cultivation of organic herbs and essential oils of Spanish origin. supplier of essential oils, fragrances, flavors, herbs and botanicals. If the business hours of nutraceutical international corporation in may vary on holidays like Valentine’s Day, Washington’s Birthday, St. Patrick’s Day, Easter, Easter eve and Mother’s day. We display standard opening hours and price ranges in our profile site. We recommend to check out nutraceutical.com/ for further information. 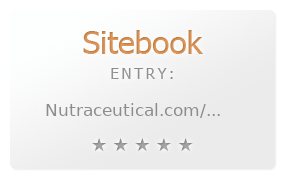 You can also search for Alternatives for nutraceutical.com/ on our Review Site Sitebook.org All trademarks are the property of their respective owners. If we should delete this entry, please send us a short E-Mail.